All the benefits of enterprise-level call center software without the cost or hassle. One-click integrations with Nimble, Zoho, Freshdesk, Google Contacts, Salesforce and many others. No phones, hardware, downloads or coding required. Talkdesk, and its innovative integrations, deliver all the features and benefits of expensive call center software systems, but without the up-front investment, hidden costs and long term contracts. Talkdesk is browser-based software, all that is required is an internet connection. As there is no costly installation or complicated setup, your agents can start working immediately. As a result, you can focus on your customers instead of managing technology. You will have a fully-functional enterprise level call center in minutes without the cost and hassle of physical technology. Ensure personalised customer interactions and increase customer satisfaction with a well informed, efficient team. Allow for easy collaboration between agents and departments by integrating your sales, marketing and support departments. 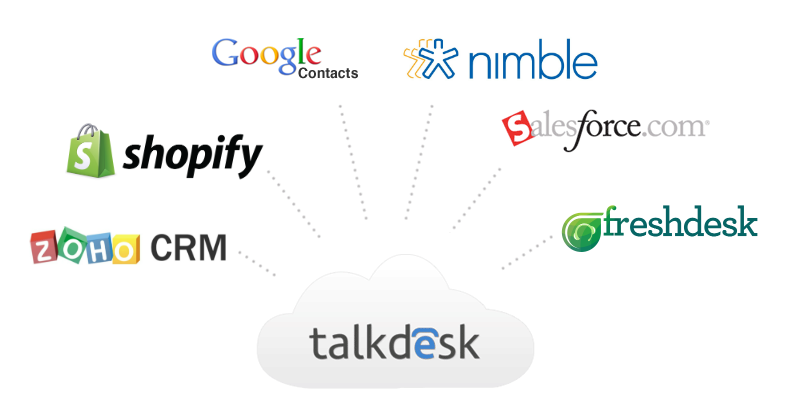 Connect Talkdesk with the other cloud-based services that you already use in seconds. Information is automatically synchronized and updated in all systems so agents will never re-enter redundant information. Leverage the functionality of your current software in one easy to use interface. Coordinate a team of international employees, or have international numbers routed to your local office. Allow your customers to call a familiar number at local rates and receive calls where it is most convenient for your team – in the office, at home, on their mobile, and anywhere in the world. Benefit from browser-based telephony, Enhanced Caller ID, IVR, Skills-based Routing and waiting queues. Click-to-call and use advanced call control features like warm transfer, hold and mute. Monitor live calls, listen to call recordings and engage in call conferencing all from the browser. Leverage real-time and historical reporting for data-driven decision-making. View caller history from business tools like Salesforce, Nimble, Zoho, Freshdesk and others. Call recordings, metrics and dispositions are automatically populated into your integrated business tools. Seamlessly integrate your entire operation in the same system. Your staff can review calls at anytime to ensure that all of your agents are compliant with your company’s quality standards. Allow your agents to add a call summary note to the call log with customised disposition codes. With features like hold, mute, call conferencing, blind transfer and warm transfer, your agents can provide their customers a more professional and seamless experience. When your agents are busy, calls will be kept on hold. Prioritise calls by value or request urgency based on your business rules. Ensure that every interaction with your company is unique, professional and informative. Make a good impression the first time and every time. By default, Talkdesk will automatically choose the best number to display on your outbound caller ID based on comprehensive information. You can also manually select your outbound caller ID number from a pull down menu. Maximise the number of simultaneous inbound and outbound calls through unlimited concurrent calls. Have several agents on the phone through a single name and flexibility adapt your system at anytime. Acquire local and toll-free phone numbers from multiple countries. Expand your business globally by employing agents internationally or have international phone numbers routed to your local agents. Route customers to the right agent based on custom criteria. Ensure that the call is directed to the right department. This IVR system will reduce call handling times and increase first contact resolution, saving your company time and money. Make sure that the most appropriate agent always gets the call with skills based routing. Increase first contact resolution and the professionalism and productivity of your company. When your team is in the field, automatically forward calls to their mobile phones. Ensure that your mobile workforce are always connected. 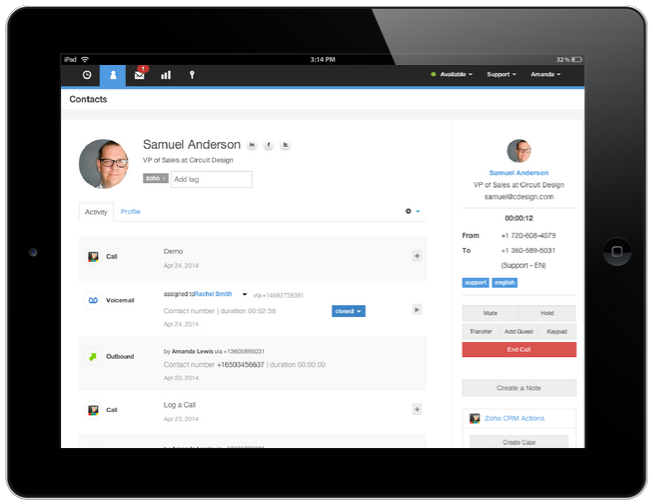 Sync information with your CRM, Helpdesk and your own systems. With access to all previous calls, voicemails and emails from the caller in real-time your agents will always be informed, even before they answer the call. Your agents will never go into a call blind. Real-time information about the caller is available in the browser, before your agents answer the phone. Organise contacts by name or company and easily segment all of your contacts. Filter your contacts by tag and beneﬁt from intelligent contact search. Compile lists of contacts from any integrated CRM, Helpdesk, contact lists that are uploaded in CSV format and from within Talkdesk. Talkdesk allows you to assign unique tags to your contacts. Agents can sort and search by tag, compile lists based on tags and easily identify contacts based on their tags. A comprehensive overview of the caller is presented in an intuitive interface as they call. This allows agents to have a complete overview of the caller’s needs. Create rules that automatically trigger actions in external systems when certain events happen in Talkdesk such as missed or inbound calls. Increase agent productivity by eliminating the need to re-enter information or duplicate tasks and have all systems on the same page. Connect Talkdesk with your company’s systems (e.g: CRM or Helpdesk), and have all the caller information synchronised and updated in all your business systems immediately. Agents never have to re-enter redundant information. Get a clear insight into your call centers performance. Listen to agent’s calls in real-time to guarantee quality standards. Work with your agents to increase your company’s effectiveness and professionalism. Analyse your call center metrics in real-time. Improve business KPIs and decrease costs by identifying inefficiencies. Monitor the performance of your company and make intelligent business decisions based on comprehensive data rather than hunches. Automate the outbound calling process so your sales team can call more contacts faster. Agents upload a list, clicks “start” and the power dialer automatically calls contacts one after another, until a contact answers. Desktop notifications alert you when the phone rings so your agents can accept the call even if they are working on a task outside of Talkdesk. Define notification rules that alert you by email (or POST request) when an event happens. Receive notifications in real-time when a call is missed or a voicemail is received. When a prospect or lead fills out a form on your website or contacts your company for the first time (via phone, live chat or email), Talkdesk will automatically create a new contact with their information such as their name, phone number, number they called, agent they spoke with, call recording, etc. 1. Obtain your Zoho CRM authentication token. Log into your Zoho account and copy the “Browser Mode” “CRM API” token. 2. 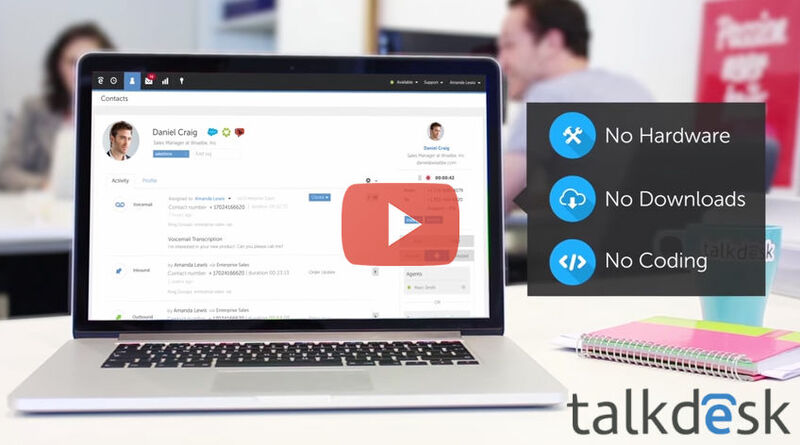 Activate the Zoho CRM Integration in Talkdesk. Log into Talkdesk as an admin. Paste your Zoho token. Click “Connect Zoho CRM”. Configure automated tasks to create cases in Zoho when a call is missed. 4. Start making and receiving calls. Make and receive calls in Talkdesk or click-to-call from Zoho CRM. And it is just as easy to integrate Talkdesk with other business applications such as Google Contacts, Nimble or Freshdesk.